as Decorative Artists, we hear that….. often. …and sounds a lot like me in 1990 when I saw a Maxine Thomas finished piece! I just knew then…….that I wanted to take the time to learn this Art style…..and I did. Well….I am here to tell you ~ you can learn to paint like this…and I am sure my Decorative Art friends and mentors will encourage you to try! If you have the desire, the willingness to learn and the patience to give it the time it needs with practice….you can paint this, I CAN TEACH YOU! In a class setting….we break things down step by step by step. We take it from an unfinished piece of wood, to basecoating, to transferring, to basecoating again, to brush care and use, to paint knowledge, to tricks of the trade….to a completed piece! Would you like to learn what ‘floating color’ is? You will learn to paint upside down….ok, maybe not being upside down, but the brush is upside down….lol! I promise we won’t be standing on our heads! Join us at the Tamaqua Community Art Center, Brush-n-Hand Studio for Art-full Classes every other Wednesday beginning on February 21, in our hometown, Tamaqua PA to paint ‘The Bakery’ ! Beginner to Experienced Welcome…..it is fun to gather with like-minded folks! …and just think, when you are all done you will have the coolest cake plate at the party! No big-box store glad-ware for you! You will not only have a beautiful keepsake….you will gain knowledge to create any Decorative Art piece on your own and have a fine set of supplies to use again and again….and join us again and again. If you are not local, the pattern to paint will be available to you at the end of February! If you are new to painting I encourage you to find classes in your area ~ the experience of attending classes always left me craving more….. Speaking of craving more…..Gosh, I keep painting sweets…..and then photographing sweets…and then eating sweets, oh boy! Pick up a brush….you will meet many wonderful friends with a ‘brush in hand’! The paint we use is acrylics thru DecoArt. You will not find a finer bottle acrylic paint. 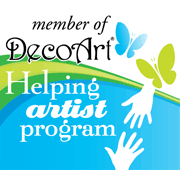 I am proud to be a DecoArt Helping Artist! I also have been working closely with an awesome brush Company, Scharff. They have prepared a brush link to purchase your first set of brushes! Anyone can purchase thru this link….if you want a good quality set of brushes….click below! The classes are offered at $20.00 per nite, payable the evening of each class. Instruction, Paint ad Pattern included with every class! If you would like to read about how the ‘Brush~n~Hand’ Studio got started….read here. See you at the Center to gather, learn, create and share! Up Next ~Sweetheart Bowl Fillers, Playin’ Favorites for Artists, Patterns~ What?, Abby’s Cupcake Picks and Sonny. Love this and want to order it Amy. Sure thing Sandy….I will message you when the instructions are completed! I’m loving this design too ! Great job Amy ! I am a “video” student of yours Amy and I learned so much from watching just one or two. I practice the skills that you taught, in my own paintings. Anyone can learn from your techniques and I look forward to many more. THE BAKERY is a must pattern packet for me. Thank you Lisa! I have lots planned this year on video….from penciling, to lining a bentwood box, to creating a cinnamon roll just like in this pattern! 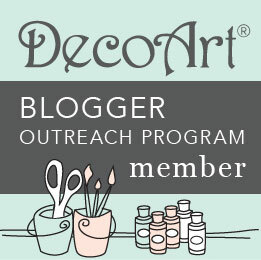 Stay tuned in…..
Definately a yummy project, so glad you are teaching others to paint…it will be a joy for you and them! Another “sweet” project! Love it!